Designing and weaving contemporary antler baskets has been my practiced art form since early in 1990, and quickly became my signature basket. It is what I’m best known for in the basketry field and what I am really passionate about creating. 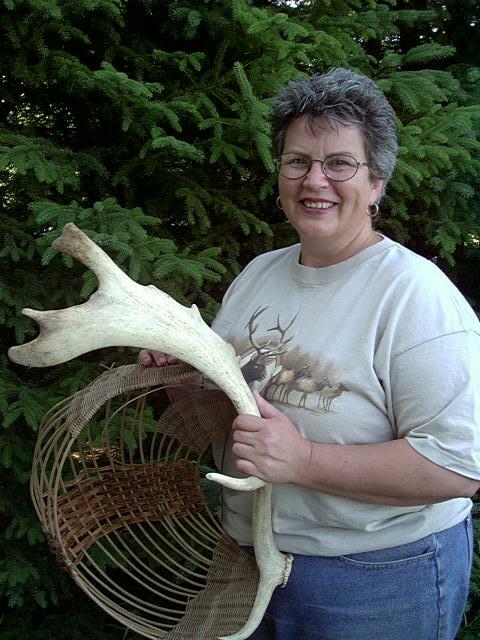 The first step I take in creating an antler basket is to sit quietly with the antler and listen as it speaks to me; hold it in my hands, place it on the table, position it on the wall, looking at all the various angles. Then the antler suggests the form the completed basket is to take; guiding my fingers, coaxing me to weave its desired shape. All the while conforming to the natural curvature of the antler itself, which is an integral part of the basket, not just simply attached to it. I love the juxtaposition of the male antlers combined with the female vessel form of the basket. The combination of these elements is also suggested and guided by the antler itself as it speaks to me. When creating these antler basket sculptures I supplement imported rattan reed by incorporating many natural weaving materials respectfully gathered from my home in the northwoods of Minnesota. Red osier dogwood, wild willow, diamond willow, cattails, sweetgrass, pinecones, birch bark, and grapevine are just a few of the materials and embellishments that make up my creations. Each material by its very nature, is unique, adding dimension and texture to the antler basket. I hope you enjoy and share my passion for all things natural and rustic having to do with my sentiments and artistic expressions, connecting me to the Universe as I create these antler basket sculptures.